It says a lot about how far (or how low) reality television has come when realizing CBS’ Big Brother can be considered in the upper echelon of the genre. Contestants parading around in as little clothing as possible, audiences shocked at people actually getting intimate in a house filled with cameras… that was almost 10 years ago. Boy, the things that pass for reality television today! Going into the Upfronts, CBS was the least exciting schedule to find out. So the leg begins with Tammy & Victor leaving at 9:27pm. They recall their horrible leg in Transylvania, but note they’ve done a lot better. Though they can’t just relax because it is very easy to go from first to last. Now either something’s happened to change the team’s arrival times or there’s been a huge oversight in the editing room because the next team, Jaime & Cara, are departing 3 hours after Tammy & Victor after midnight, which doesn’t make sense because they were on the Mat together last leg and Mark & Michael were one-hour ahead before getting the penalty. Very strange indeed. Jaime & Cara find a “taxi” but they are not sure if the driver is telling them the truth, they find a police officer to make sure, and the driver starts talking to the cop. Jaime gets heated which leads to her explanation that she’s like Jekyll and Hyde. Mark & Michael say they hope they don’t shoot themselves in the foot. All the teams arrive in Bangkok, Thailand and rush to the taxis to get to their first clue. Jen & Kisha get in front of Margie & Luke. Margie tells their driver to follow. They both drivers stop and Jen & Kisha’s driver gets out to ask Margie & Luke’s driver if he knows where to go. They ask people on the street and Jen & Kisha get directions and head off, but someone else is yelling at Margie & Luke’s driver and telling them different directions. They separate and the mother and son arrive first at the clue, finding the Road Block. In this Road Block, Who’s ready to propel their team forward?, teams will have to assemble and attach a propeller to a long tail boat. When attached correctly, they can use the boat to get to their next destination and clue. The next clue given to them inside the boat, tells the teams to use the provided map to navigate the maze of canals to find Peninsula Pier for the next clue. Jaime & Cara arrive next at the pier, followed by Tammy & Victor, and Mark & Michael. After finishing, Jaime & Cara left their bags in the taxi and they tell the boatman to take them back to the pier so they can get them, because as soon as they finish the Road Block, they’ll take the boat to the next clue. They make a point not to let the other teams on to what they’re doing. As Victor continues to get his propeller on, Mark finishes and they head off. They decide to leave their bags, thinking the boats will come back to that pier. Jen & Kisha leave their bags as well, Kisha even leaving her shoes and they head out. However, Kisha has also left the fanny pack on the pier. Their fanny pack with all their passports and other important documents. With Jen thinking Kisha meant their backpacks, they decide to go on and go back later. Victor finally gets his propeller assembled and the man says its okay and they set off, but it doesn’t work. They have to go back to the pier for him to fix it. He gets it on and they start off, but Tammy says they should get their bags first. They get off the boat, tell the man to wait and they get their bags. Meanwhile, Margie & Luke arrive at Peninsula Pier and get their next clue, the Detour. In this Detour teams have to choose between tasks familiar to locals, Broken Teeth or Broken Record. In Broken Teeth, teams must make their way to what is commonly known as the Street of Happy Smiles. There they must search through dentures and find the right ones for five patients by trying them on. In Broken Record, teams make their way to a parking lot in Chinatown and find party taxis parked and waiting with several passengers. They must ride along a 5 mile course in the taxis that are equipped with karaoke systems and sing along to a popular Thai pop video. Margie & Luke choose Broken Teeth. The other teams get to the pier and they all choose Broken Record. Jen & Kisha say they’ll go do the task and go back for the stuff later. Kisha remains barefoot. Mark & Mike want to get back on the boat and go back, but it has gone. They try to find a taxi and they argue over whether to go to their first taxi, have the taxi come to their current location, or have the taxi meet them in Chinatown. They end up taking their new taxi back for 200 . They are worried about having enough money left. Meanwhile, Jen & Kisha arrive at the party taxis first followed by Jaime & Cara and they start singing. Tammy & Victor are right behind them. “Mai Thai Trannies!” Tammy exclaims. So that’s why they seemed different, but familiar! I’ve seen many of them on Philippine TV (no joke!). Back at the teeth, Margie is flying through the task, but Luke hasn’t even gotten one yet. Margie says Luke was fitting bottom teeth on the top and he seems to not making any headway. After 4 patients done, Margie takes over for Luke and she finds the right dentures, as they get their next clue telling them to go to the Pit Stop, Phya Thai Palace. They head to find Phil, are welcomed by a parrot, and Margie & Luke are officially first, winning a trip to Puerto Rico. Jen has three questions about their Detour. They finish, but they don’t have money. They get in a taxi, tell the driver that and he says “No.” They get out and try to find another taxi. Jaime & Cara are next and can’t find a taxi. Tammy & Victor catch up, Tammy catches a taxi and they are off with the girls right behind. They follow the siblings. They both stop for directions, but Jaime & Cara’s driver knows where to go, so they leave Tammy & Victor behind, going a different way. Jaime & Cara arrive at the Pit Stop 2nd. Later, Jen & Kisha catch up to Tammy & Victor and stay right behind them. They both get out at the same time. It’s a footrace to the Pit Stop, but the sisters arrive before the siblings. Phil informs them that he can not check them in without their travel documents that they’ve left back at the pier. They hurry back and ask another driver to take them for free. That means Tammy & Victor are officially team #3. Jen & Kisha run to find a taxi and they head all the way back to the pier. Mark & Michael arrive at the party taxis, but first have to pay the taxi they rode to get there. They don’t have enough money, so they offer to give the driver a flashlight and compass. He takes them. They get to the task and they start to have fun with the “pretty local girls.” One “pretty local girl” starts teasing Michael, putting her fingers on his shoulders and starting down his chest. The sisters arrive at their first taxi and get their belongings. They decide to take that taxi back to the Pit Stop since he knows where it is. Mark & Mike arrive at the Pit Stop, don’t have enough money again, so they offer more of their personal items. They run into the Pit Stop and arrive 4th. However, they broke a rule by using personal possessions to pay for a taxi, which results in a two hour penalty. With them doing it twice, they have incurred a total four hour penalty. Jen & Kisha arrive with the brothers waiting off to the side and they are officially team #4. With 3 hours and 10 minutes left on their penalty, Phil checks them in. The remainder of their penalty will be assessed at the beginning of the next leg and of course they’ll have a Speed Bump to deal with. So it wasn’t a too eventful leg, but we got a good lesson on following the rules on the Race. Having it be a non-elimination leg also wasn’t a big surprise. It was expected, which brings up the fact that they should really find a way to make the non-elims less predictable or bring back To Be Continued/superlegs. The rule Mark & Michael were penalized for is actually a good one. One of the things that’s always been a part of the Race is the teams’ ability to budget their money. From limiting the amount given to each tea, to the $1 legs, to taking all their money away at non-elims, money has always been an important part of the Race. So it is a little unfair that teams can just sell personal belongings or give away stuff instead of using their money. It could lead to teams just handing over things they brought with them instead of using the money they are given by the Race. That said, a two-hour penalty is kind of harsh, but I guess Bert and Co. feel that penalty fits the violation. From reading around the internets, I see it is okay if teams use things they’ve bought with the money given to them, but not stuff they’ve brought from home. Also, fans are pointing out Jen & Kisha’s free taxi rides. In the Additional Route Info, and from past seasons, teams must make sure the taxi driver is satisfied with whatever payment the teams give. Teams must make sure the taxi driver is happy and accepts their payment before they can go, a rule probably instituted after Colin’s trip to the police station in TAR5. It would be very interesting to see the evolution of the TAR rulebook over the last 14 seasons. I’m sure there have been a lot of changes and it would be very interesting seeing what’s in and what’s out and what events in the Race actually prompted the changes. Just like the rules in this leg. It really just puts into perspective how much work goes into planning the Race. It must be a tough job, but a fun one Bert and Co. have. Anyway, it was an okay leg. I think the fun local Thai people waiting for dentures and the happy taxi “women” made the episode though. Who’s ready to propel their team forward? Tammy & Victor – It is great to see them continuing to work well together. And in turn, they are performing better in the Race. Barring any big mistakes, I think they are a lock for Final 3. Cara & Jaime – Jaime is still a firecracker, but they have raced well so far and stepped it up too. I am happy to see they are doing things on their own more than sticking with Margie & Luke all the time. They could be a final 3 team as well. Kisha & Jen – Their sisterly communication still needs some work. I think if they fully trusted each other, they’d work better together because their missteps have cost them and they have usually been because of their lack of (good) communication. They seem to stay calm when problems arise, but then they don’t really fully talk it out either, which might not be the best thing to do. Margie & Luke – Well, Margie continues to carry their team. Luke was no help at the Detour and he seemed to be the one to choose Margie doing the Road Block. And of course their antics we don’t see on-screen. But they’re Racing well otherwise and they are still very strong despite Luke not contributing as much as his mom (and it has nothing to do with being deaf). Mark & Michael – Well, that’s two legs in a row of penalties. That isn’t good at all. They’ve kind of been the bumbling brothers this whole Race and sort of the next generation Dandrew, which is also not a good thing. It’ll be tough for them next leg unless the airport equalizes them enough for them to catch up and complete the Speed Bump. Listen to Jodi & Christie’s interview with BuddyTV and how they rivaled TAR13’s Tina’s plane recall to get corporate to reclassify seats for them! Jodi & Christie talk to TVGuide about Christie’s underwear run. Brad & Victoria tell TVGuide about the new challenges in life they are about to and ready to face head-on. Brad & Victoria tell RealityTVWorld that they are no strangers to tough challenges. After staying at the “best Holiday Inn” in the world, Brad & Victoria made up lots of time and are bummed after hearing about Tammy & Victor’s meltdown, they tell the LA Times. Did Bad Luck Do In Jennifer & Preston? Plus Bertram and Elise Answer Fan Questions! Bertram van Munster and Elise Doganieri talk about their favorite parts of the Race, TAR in HD, and what they really think about Phil’s Emmy snub and All-Star seasons. Jennifer & Preston talk to TVGuide about what really happened before the Pit Stop and how the right taxi could’ve saved them from elimination. Jennifer & Preston tell Reality Wanted the cheese task was even harder than it looked and what their plans are post-TAR. 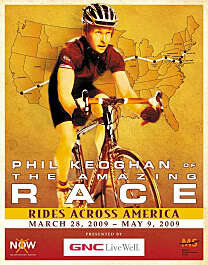 TVGuide.com has begun naming its Best of 2008 and The Amazing Race was named the Best Reality Show of the year. While some other reality shows — okay, every other realty show — seems to bring out the worst in humanity, this one highlights the best. And oh, those locations.